The location will be a prominent factor in the types of rent you can get. The good thing about Destin and Santa Rosa Beach is that just about all the condos are either beachfront or Gulf view which makes their neighbors the Gulf of Mexico! You can’t beat that. 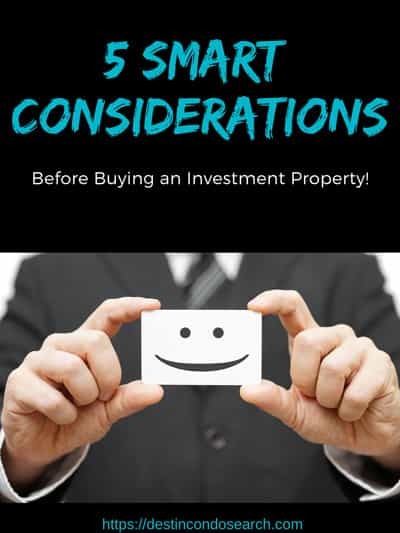 If you are a new investor, you may want to consider a condominium. Condos can be extremely easy to rent, manage and maintain. Good tenants will be looking for properties in desirable locations which means close to the beach, restaurants, and entertainment. Research the crime rate and the security that’s offered by the specific condo you are interested in. If you’re investing in The Panhandle of Florida, renters will be shopping for the best deals on condos that are upgraded and have easy beach access. The purchase price is only the beginning… as with any real estate purchase, you will want to have the property inspected by a qualified professional. You will want to make any needed repairs before having tenants rent so you’ll need to calculate the mortgage payments you’ll have to make before you have rent coming in to cover them. When deciding on the rent, a basic rule of thumb is to bring in at least 1% of the purchase price each month – so if you paid $200,000 for the home, you should net $2,000 a month. Before you calculate the rent, research what rental properties are going for in the condo. The 1% rule of thumb is more of a guide. When working with Team Margagliano you will get a complete investor analysis worksheet on any condominium you have interested. In addition to the mortgage, you will want the rent to cover property taxes, insurance, the cost of a property manager (if you decide to go that route), and on-going repairs. Property taxes on rental properties can be higher than for your primary residence because you will not be claiming homestead tax exemption. Check with the local tax assessor to get the correct information for your property. 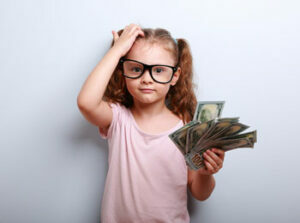 When considering insurance, you’ll need to decide if you want a smaller premium and a high deductible, or vice versa. For properties along 30a, you will need to factor in insurance for flooding, sinkholes, or hurricanes. Call and talk to a representative for the most accurate information. If you decide to go with a property manager, factor in about 20% of the rent in addition to fees they may charge for finding tenants and supervising maintenance contractors. It is recommended to always have enough available cash on hand to cover an unexpected large repair, like a new roof or HVAC system. There is a saving grace to insurance when it comes to condos. All condos along the Emerald Coast and the rest of Florida hold master insurance for the entire condominium. This will pay to replace the whole structure up to the drywall. You as the owner will be responsible for maintaining insurance coverage for the contents. That will cost much less insurance on a single-family home. Investment properties can give you a great return, but they are not a way to get rich quick. Remember that even reality tv still has an element of fiction to it. If you’re willing to put in the time and use self-control when it comes to managing income, you could earn yourself some financial freedom down the road. Multiple offers occur on condominiums usually when the properties being sold as a foreclosure or REO. When a property is being sold as a foreclosure or REO and is priced well it is not uncommon for multiple offers to occur. These are bank owned properties that have been repossessed from the owners for default of payment. As unfortunate as this is it can open up an opportunity for you to buy a condo for under market value. Know your pricing, know your trends in the real estate market, know the latest interior design fads, know your handyman, your plumbers, know your electricians, know your painters, know your real estate agent, and then get to know 2 or 3 more of each of these categories just in case some disappear.